Jimmy T. as he appears in WarioWare Gold. Jimmy Thang, more commonly known as Jimmy T., is a major human character in the WarioWare series. He first appeared as one of WarioWare, Inc.'s employees in WarioWare, Inc.: Mega Microgame$!. He is an obsessive disco-dancer with a blue afro wig and a mustache that resembles musical notes. He enjoys dancing at nightclubs, particularly Club Sugar. His relatives, including his parents and siblings, all share his passion for dancing. 1.1.2 WarioWare, Inc.: Mega Party Game$! Jimmy T. congratulating the player after beating his stage in WarioWare, Inc.: Mega Microgame$! Jimmy is first seen in WarioWare, Inc.: Mega Microgame$! 's intro, called by Wario to join his "company", WarioWare, Inc., and to produce microgames for his upcoming game. Alongside Wario's other friends, he agrees. In his own story, Jimmy frequents a dance club called Club Sugar. There, he dances to disco music and takes out his ringing cell phone. When the show's over, he leaves the club walking past people, using his cell phone to listen to another ringtone, this time a dog's barking. Jimmy also makes a short appearance in the game's ending story. In the WarioWare headquarters, Wario runs off with the profits made from the game after he's called out on hoarding it. Jimmy is shocked, but doesn't chase after him. He later watches as Wario plummets to the ocean. Jimmy T. is featured in three unlockable minigames in WarioWare, Inc.: Mega Microgame$!. A tiny Jimmy appears in a two-player minigame called VS Chiritorie. At random intervals, he wanders around the screen. If he's sucked up, he clogs the vacuum cleaner that's sucking him and causes it to spit out wads of paper. Fly Swatter features Jimmy in the congratulation sequence. The minigame Paper Plane features him as the very first character looking through a window and telling the current flight time. In WarioWare, Inc.: Mega Party Game$!, it is revealed that he had a girlfriend, who dumped him because she thought that he enjoyed dancing more than spending time with her. In Club Sugar, she asks him if he liked her or dancing more. Shortly afterwards, Jimmy starts to dance, causing the woman to leave. Jimmy bursts into tears and claims that the rhythm made him do it. Jimmy T. is one of the ten selectable characters in the multiplayer games in WarioWare, Inc.: Mega Party Game$!. Jimmy's parents, Papa and Mama T., are introduced in WarioWare: Twisted!. They dance along with their son at Club Sugar. While the family's still on the dance floor, Sugar the club owner tells the Thangs that the dinner they ordered is ready. However, instead of eating, they play around with their cell phones, posing for pictures and snapping shots of themselves. Annoyed, Sugar says that their dinner is getting cold, and he finally tells Jimmy and his parents to leave Club Sugar and closes the club. In WarioWare: Touched!, a speaker announces "Jimmy's Showtime" at Club Sugar. Jimmy appears on the dance floor as usual and receives the applause of the public. He then summons his parents and his younger siblings Jamie and James T.. The family starts to dance, but an orange bug called Scratchy the 'Fro Bug flies through Club Sugar and lands right into Jimmy's wig. This causes Jimmy's afro to feel really itchy and he starts to move erratically. However, the other Thangs think that Jimmy's moves are just another dance. After scratching the bug out of his wig, Jimmy continues dancing with his family. After the show's end, the Thang family walk through the streets of Diamond City. Scratchy, now with a bandage on its head, reappears and flies into Jimmy's wig, causing him to move hectically again. Once again, his family thinks that he's just dancing. In WarioWare: Smooth Moves, Jimmy walks down to Club Sugar with an umbrella on a rainy night. While he's walking, he sees a soaked cat, and decides to give the cat his umbrella. Later, the cat, along with a lot of other cats, follow Jimmy and imitate his dance movements. Jimmy and the cats start to dance for awhile and continue to dance once they reach Club Sugar. After their dance is finished, the cats walk out, each saying "meow." At the end, the pitied cat gives the umbrella back to Jimmy, earning a smile from him. At the end of Jimmy P.'s story, Jimmy T. pats on Jimmy P.'s shoulder, leading to the two of them facing each other. In WarioWare: Snapped!, Jimmy T. runs the newly opened Wario Park along with Wario, Mona, and Kat and Ana. Jimmy stars in his own aerobics TV show called Jimmy's Aerobics in WarioWare: D.I.Y., where he is seen doing aerobics along with two women in the background. In Game & Wario, Jimmy T. hosts the Ski minigame. In the minigame's introduction, Jimmy is seen skiing with some women and a bear. Jimmy T. is also seen in the Bowling minigame, depicted on a bowling pin like with the other characters. Jimmy T. reappears in WarioWare Gold. In his story, a cat takes refuge in Jimmy's hair while the oblivious Jimmy runs into two female fans of his. They take many pictures of him as the night goes by. When they are done, they show him the "best" picture, which happens to be of the cat. Jimmy is initially shocked, but shrugs it off. During the Dancing Team set of the Ultra League, Jimmy T. arrives with Mona, Dr. Crygor, Mike, Fronk, Young Cricket and Master Mantis, Kat and Ana, and Penny to assist Joe in filling up his new nightclub, Club Joe. He is seen dancing with the rest of the group. Jimmy T. makes an appearance in the Wario... Where? challenge set of Rhythm Heaven Megamix. He appears in the set's version of The Clappy Trio 2, in which he replaces the rightmost member of the trio. As with most of the series cast, Jimmy is featured as one of the collectable in the WarioWare set of Nintendo Badge Arcade. Jimmy is also featured in a set of badges parodying The Legend of Zelda: Majora's Mask. The set has Jimmy dressed as Skull Kid. Jimmy T. comes with his own set of microgames in all games of the WarioWare series, except for WarioWare: Smooth Moves. For WarioWare, Inc.: Mega Microgame$!, Jimmy created microgames of the Sports genre. As its name implies, all games involve some kind of sports. He also provides two remixes, meaning that he provides mixes of the microgames of other characters. WarioWare, Inc.: Mega Party Game$! does also feature Jimmy's sports microgames, plus a multiplayer game made by him, Survival Fever. Instead of sports, it features Jimmy's favorite activity, dancing. Jimmy's microgames in WarioWare: Twisted!, involve a particular style of gameplay rather than a specific visual theme, which was also continued for the next games in the series until WarioWare: D.I.Y.. In this game, his set of microgames is called Big Tipper and requires large spins. In WarioWare: Touched!, the name of Jimmy's set of microgames is Dance Club Rub and involves rubbing with the Stylus. WarioWare: Smooth Moves is the only game that doesn't feature microgames of his. Instead, he provides a mix of microgames of other characters again, like Jimmy P. also does. The games start at Level 2 instead of Level 1. Jimmy's five microgames in WarioWare: Snapped! require the player's acting skills. He puts photos taken of the player into a comic strip after the end of his stage. In WarioWare: D.I.Y., Jimmy returns to his original role and hosts a set of new Sports microgames. In WarioWare Gold, he once again hosts Sports microgames, this time in the Mash League. Hey, hey! It's Jimmy T.! Big moves, bigger wigs, and only the biggest sports games! To boogie with me, you gotta send me cell-mail. And you? You say that you and Wario are really tight? That's cool! C'mon, let's hit my favourite disco and get funky 'till dawn! I know Wario looks offbeat, but he and I go way back. Plus, he always sends me cell-mail! Bio: This guy loves the dance floor more than anyone else. He stays up dancing all night at Club Sugar. His hairdo hides a secret, but he refuses to tell anyone what it is. "Put on your dancin' shoes and join the disco king for a rub, rub, rubdown down at Club Sugar." Rank C – This cool dude is often spotted at Club Sugar burning up the dance floor with his moves. He's an original. Rank B – He's a man of few words when talking. But when texting? There's no one chattier than Jimmy T.
Rank A – The color of his hair changes once in a blue moon. They say if you see "red Jimmy," you'll have good luck. For this subject's image gallery, see Gallery:Jimmy T..
"Hey, hey! It's Jimmy! Big moves, bigger wigs, and only the biggest sports games!" 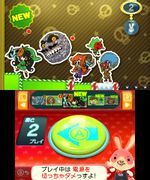 - WarioWare, Inc.: Mega Microgame$! "I know Wario looks offbeat, but he and I go way back. Plus, he always sends me cell-mail!" - WarioWare, Inc.: Mega Microgame$! "Yo, bro'! Thang is my name, the groove is my game!" - WarioWare, Inc.: Mega Party Game$! "No! The rhythm made me do it! I didn't..." - WarioWare, Inc.: Mega Party Game$! "Yo-yo! Everyone got the fever? I've always got it! That's because the dance floor's hot!" - WarioWare: Twisted! "I'm on fire tonight! Check out my killer moves. They're larger than life, just like my hair." - WarioWare: Twisted! "Yo! If you thought I had some wicked dance moves, my family will blow your mind." - WarioWare: Touched! "Yo, my family knows how to burn up the dance floor!" - WarioWare: Touched! In Super Smash Bros. Brawl, one of the names that appears when the player presses the "Random Name" button when naming their custom stage is JIMYT. Jimmy T. and Fronk are the only employees in WarioWare: Twisted! who don't appear in Wario-Man's ending. ↑ NintendoRU. (October 11th, 2018). WarioWare Gold: трейлер Джимми Ти (Nintendo 3DS). Retrieved October 11th, 2018. ↑ iQue. WarioWare Touched! for Nintendo DS. Retrieved December 6, 2016. This page was last edited on March 30, 2019, at 15:57.